"Taikong" is the Mandarin Chinese word for outer space. And you can pretty much figure out the rest. 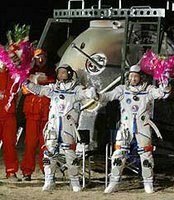 Obviously, the Taikonauts are Chinese astronauts who’s bosses at the Chinese Space Agency make any just about NASA public relations event look like (excuse the reverse pun) a Chinese funeral. Well, the Chicoms are actually serious about this whole space race deal and are planning a permanent Chinese base on the moon by 2020 with the first lunar orbiter demonstration set for 2007. Shown in this picture is the official Chinese government’s celebration of a pair of returning hero Taikonauts at a Super Bowl-like gala complete with scantily clad Chinese cheerleaders. If our first impulse is a stuffy western guffaw – we’d better laugh now and get it over with. If we look back at the skimpy US records accomplished with the truncated Apollo program, it won’t require many of these gaudy celebrations until Taikonauts leave US Astronauts and their yawning taxpayer base in a cloud of antique 1960’s lunar dust. So when it is time for the United States to really get serious about this? How about yesterday.